Meghan joined the company has a HSEQ Coordinator in 2014. She obtained a postgraduate diploma in Occupational Health and Safety from Curtin University a year earlier. 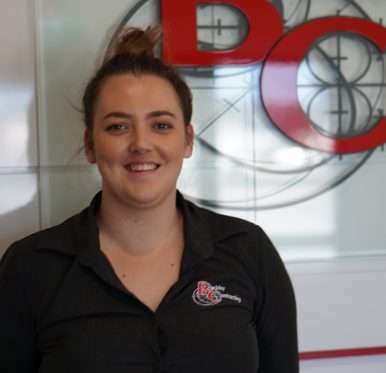 In just a few years, she has stepped up to become the HSEQ manager of Buckby Contracting. She has been able to maintain and recertify the company in accordance with AS/NZS 4801, OHSAS 18001, ISO 9001 and ISO 14001. Her commitment in promoting a positive culture has been growing along with the company. Her day to day task focuses on ensuring the organisation is compliant with the HSEQ system. She does this with a strong positive attitude that is well known within the organisation. One of her main drivers is incident investigation and reporting. This results in continuous improvement leading to improved productivity and overall performance of the company. Meghan has a real passion in driving the company and its employees to achieve recognition. She has successfully pushed for the company to win the 2016 Work Safe Award, winning entries to trainees of the year and submissions on job awards. Buckby Contracting recognises this commitment by allowing her with authority and job autonomy.